graceewhite | WRITE WITH YOUR MINDS ON FIRE. KESENNUMA, Japan — Schools here begin class in April and hold graduation ceremonies in March; like spring, they represent renewal and rebirth. On Tuesday morning, in a school meeting hall in this tsunami-ravaged seaport, it became something else: an act of defiance. Gathering in the shadow of this seaport’s tsunami disaster zone, two solemn and often tearful crowds met to award diplomas to the sixth- and ninth-grade classes of Hashikami Elementary and Junior High schools. Inside the junior high auditorium, hundreds of refugees from the March 11 tsunami rolled up their blankets and moved to the rear to make way for a ritual that any parent would instantly recognize: the strains of Pachelbel’s Canon; the students’ march to the podium; the singing of school songs; the snapping of cellphone photos. But no one should be fooled. The ceremonies, important rites of passage here, were supposed to take place last week. Instead, an earthquake cracked open the elementary school, and a wall of water swept away homes and families of teachers and students alike. Although no Hashikami elementary students were killed, the body of a ninth grader was identified over the weekend, and two others remain missing. For parents and teachers, holding the graduation celebrations under those circumstances — and their own — was an act of will, even bravery. Ms. Sugawara’s sister and brother have been missing since the tsunami struck, and her house was washed away. Of the two other teachers who played leading roles in the ceremony, one lost his house, and the other’s parental home, in Rikuzentakata, was all but wiped out. As the 28 ninth graders awaited their diplomas, Shunichi Hatakeyama, 48, sat centered in the front row of parents, holding a photograph of his 15-year-old son, Fumiya. The youngest of three sons, a big, good-looking center fielder on the city youth baseball team, Fumiya was with his mother, Akiko, when the tsunami struck. The two fled separately to high ground. Only she made it. On Tuesday, Mr. Hatakeyama wore Fumiya’s blue athletic shirt and white sneakers. “My son is still missing. If I don’t come, nobody will take his diploma,” he said. And while the 42 sixth graders fidgeted in their chairs, Ken Miura, a 37-year-old hotel cook and volunteer fireman, sat in the back row of parents. His 12-year-old son, Takumi, is still recovering. The two were at home, not five minutes from school, when the tsunami warning sounded. Mr. Miura rushed to evacuate neighbors on lower ground, never believing the water could reach his home. He was carried out to sea in an automobile, and Takumi was swept into the ocean for an hour before he was rescued, naked and debris-battered, by firemen. Takumi was taken to relatives in a distant town, in shock and unable even to talk for days. When he began to speak, “he said he wanted to come to the ceremony,” Mr. Miura said, “but I couldn’t get the gasoline to go to him.” The disaster has effectively dried up gasoline supplies for all but emergency permit holders. Teachers handed over his son’s diploma in a private ceremony after the public one. Past graduations were ritual new beginnings, the teachers said, but Tuesday’s may be different. Whereas past classes generally stayed together during their school years, the disaster already has scattered students to evacuation centers, and many may wind up in other towns. The students here made determined efforts to remain upbeat. But many proved unable to hold back tears, whether singing school songs or joining in the brief after-graduation party. 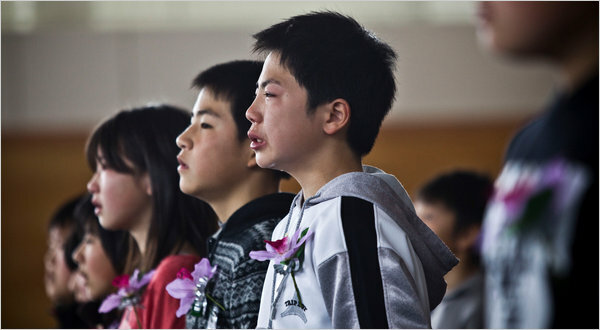 “They tried not to show their sadness, but we couldn’t see them smiling,” said Yasuyuki Toba, one of the ninth-grade teachers who led the ceremony. So to end the party, he led a chant for the students clustered around him. “Let’s meet again!” he shouted. Times are tough. Kids should be learning harsh financial truths right about now, no? Lessons learned: Money doesn’t grow on trees, nor is there an endless supply in Mom or Dad’s wallet, right? Not necessarily. A survey by the Northwestern Mutual Foundation, conducted on its financial literacy site, themint.org, finds that today’s parents are “incredibly lenient” about handing their children extra money. The lesson that is being taught, the foundation warns, is one of immediate gratification rather than budgeting or financial discipline. 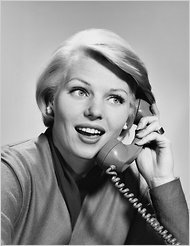 The survey asked children, ages 17 and younger, “How often did your parents say ‘O.K.’ when you asked for extra money beyond an allowance”; 63 percent answered “always” while 26 percent said “sometimes” and 6 percent said “never.” Only 5 percent of children said they had never asked. And how does this compare with earlier generations? Among adults, ages 18 to 45, 12 percent agreed with the statements “I always got extra money beyond an allowance from my parents when I asked”; among adults ages 46 to 59, 8 percent agreed; among adults 60 and older, 13 percent agreed. The reasons kids want this extra money appears to be changing, too. Today’s teens say they spend it on tickets to movies, concerts and sporting events (40 percent), food and drink (24 percent) and toys and games and phones (19 percent). Only 15 percent said they wanted something for school, compared with 47 percent of adults over 60 who gave education as their reason for asking for extra money when they were young. It could be, of course, that memory and perception are in play here. But the numbers are dramatic enough to make you think about whether today’s parents open their wallets too easily and too often.I personally recognize a changed family dynamic in these statistics. Students: Share how this issue plays out your family — and whether you are learning money management skills like budgeting. Do you believe in getting an allowance? Do you ever need more money? If so, why? How do you think your family could do better in terms of teaching you how to deal with money issues, or how are they doing well? What advice do you have for younger children who are just starting to be responsible for handling money? What was the message you took from this Ted Talk? Share your thoughts. Be specific, and refer to what was said in the talk. 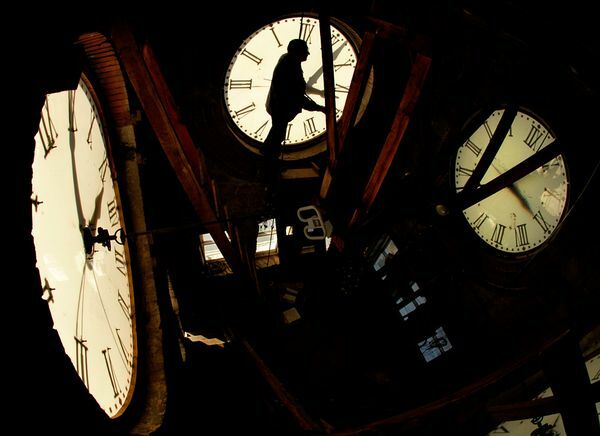 Daylight Saving Time 2011: Why Does It Begin? With daylight saving time (also called daylight savings time) kicking off again, clock confusion is once again ticking away: Why do we spring forward? Does daylight saving time really save energy? Is it bad for your health? Get expert answers below. When Did Daylight Savings Begin in 2011? For most Americans, daylight saving time 2011 started at 2 a.m. on Sunday, March 13, when most states sprang forward an hour. Time will fall back to standard time again on Sunday, November 6, 2011, when daylight saving time ends. The federal government doesn’t require U.S. states or territories to observe daylight saving time, which is why residents of Arizona, Hawaii, Puerto Rico, the Virgin Islands, American Samoa, Guam, and the Northern Marianas Islands won’t need to change their clocks this weekend. Where it is observed, daylight savings has been known to cause some problems. It’s enough to make you wonder—why do we do use daylight saving time in the first place? Ben Franklin—of “early to bed and early to rise” fame—was apparently the first person to suggest the concept of daylight savings, according to computer scientist David Prerau, author of the book Seize the Daylight: The Curious and Contentious Story of Daylight Saving Time. While serving as U.S. ambassador to France in Paris, Franklin wrote of being awakened at 6 a.m. and realizing, to his surprise, that the sun would rise far earlier than he usually did. Imagine the resources that might be saved if he and others rose before noon and burned less midnight oil, Franklin, tongue half in cheek, wrote to a newspaper. In the U.S. a federal law standardized the yearly start and end of daylight saving time in 1918—for the states that chose to observe it. During World War II the U.S. made daylight saving time mandatory for the whole country, as a way to save wartime resources. Between February 9, 1942, and September 30, 1945, the government took it a step further. During this period daylight saving time was observed year-round, essentially making it the new standard time, if only for a few years. Since the end of World War II, though, daylight saving time has always been optional for U.S. states. But its beginning and end have shifted—and occasionally disappeared. During the 1973-74 Arab oil embargo, the U.S. once again extended daylight saving time through the winter, resulting in a one percent decrease in the country’s electrical load, according to federal studies cited by Prerau. Daylight Saving Time: Energy Saver ? In recent years several studies have suggested that daylight saving time doesn’t actually save energy—and might even result in a net loss. Environmental economist Hendrik Wolff, of the University of Washington, co-authored a paper that studied Australian power-use data when parts of the country extended daylight saving time for the 2000 Sydney Olympics and others did not. The researchers found that the practice reduced lighting and electricity consumption in the evening but increased energy use in the now dark mornings—wiping out the evening gains. Likewise, Matthew Kotchen, an economist at the University of California, saw inIndiana a situation ripe for study. Prior to 2006 only 15 of the state’s 92 counties observed daylight saving time. So when the whole state adopted daylight saving time, it became possible to compare before-and-after energy use. While use of artificial lights dropped, increased air-conditioning use more than offset any energy gains, according to the daylight saving time research Kotchen led for the National Bureau of Economic Research [PDF] in 2008. That’s because the extra hour that daylight saving time adds in the evening is a hotter hour. “So if people get home an hour earlier in a warmer house, they turn on their air conditioning,” the University of Washington’s Wolff said. In fact, Hoosier consumers paid more on their electric bills than before they made the annual switch to daylight saving time, the study found. But other studies do show energy gains. In an October 2008 daylight saving time report to Congress (PDF), mandated by the same 2005 energy act that extended daylight saving time, the U.S. Department of Energy asserted that springing forward does save energy. Extended daylight saving time—still in practice in 2011—saved 1.3 terawatt hours of electricity. That figure suggests that daylight saving time reduces annual U.S. electricity consumption by 0.03 percent and overall energy consumption by 0.02 percent. While those percentages seem small, they could represent significant savings because of the nation’s enormous total energy use. 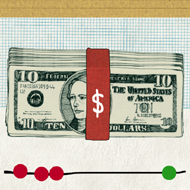 What’s more, savings in some regions are apparently greater than in others. California, for instance, appears to benefit most from daylight saving time—perhaps because its relatively mild weather encourages people to stay outdoors later. The Energy Department report found that daylight saving time resulted in an energy savings of one percent daily in the state. But Wolff, one of many scholars who contributed to the federal report, suggested that the numbers were subject to statistical variability and shouldn’t be taken as hard facts. And daylight savings’ energy gains in the U.S. largely depend on your location in relation to the Mason-Dixon Line, Wolff said. Daylight Saving Time: Healthy or Harmful? For decades advocates of daylight savings have argued that, energy savings or no, daylight saving time boosts health by encouraging active lifestyles—a claim Wolff and colleagues are currently putting to the test. But others warn of ill effects. Till Roenneberg, a chronobiologist at Ludwig-Maximilians University in Munich, Germany, said his studies show that our circadian body clocks—set by light and darkness—never adjust to gaining an “extra” hour of sunlight to the end of the day during daylight saving time. “The consequence of that is that the majority of the population has drastically decreased productivity, decreased quality of life, increasing susceptibility to illness, and is just plain tired,” Roenneberg said. One reason so many people in the developed world are chronically overtired, he said, is that they suffer from “social jet lag.” In other words, their optimal circadian sleep periods are out of whack with their actual sleep schedules. Shifting daylight from morning to evening only increases this lag, he said. Other research hints at even more serious health risks. A 2008 study in the New England Journal of Medicine concluded that, at least in Sweden, heart attack risks go up in the days just after the spring time change. “The most likely explanation to our findings are disturbed sleep and disruption of biological rhythms,” lead author Imre Janszky, of the Karolinska Institute’s Department of Public Health Sciences in Stockholm, told National Geographic News via email. With verdicts on the benefits, or costs, of daylight savings so split, it may be no surprise that the yearly time changes inspire polarized reactions. In the U.K., for instance, the Lighter Later movement—part of 10:10, a group advocating cutting carbon emissions—argues for a sort of extreme daylight savings. First, they say, move standard time forward an hour, then keep observing daylight saving time as usual—adding two hours of evening daylight to what we currently consider standard time. But don’t most people enjoy that extra evening sun every summer? Even that remains in doubt. National telephone surveys by Rasmussen Reports from spring 2010 and fall 2009 deliver the same answer. Most people just “don’t think the time change is worth the hassle.” Forty-seven percent agreed with that statement, while only 40 percent disagreed. But Seize the Daylight author David Prerau said his research on daylight saving time suggests most people are fond of it. “I think the first day of daylight saving time is really like the first day of spring for a lot of people,” Prerau said. “It’s the first time that they have some time after work to make use of the springtime weather.